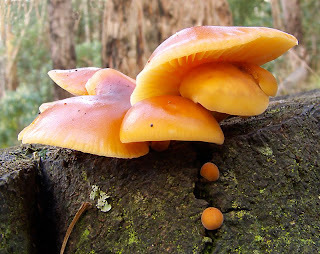 Mark's Tasmanian Bush Blog: Fungi ID? I returned to the brown mushroom from the other day. Looks to me like all the mushrooms are the same species, but they are varying sizes, and were in different stages of growth the other day. 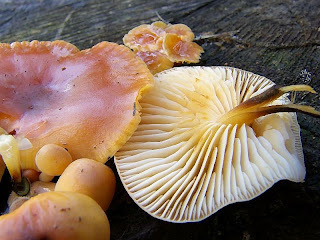 I took a few shots from varying angles today, including one of the gills. 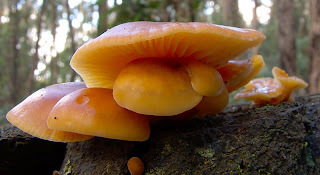 Looking at these a few days later I suspect this is Flammulina velutipes. There is quite a lot of variation in the pictures labelled as this species on the net. Nice photos - especially the last one. Unfortunately I cannot help with the ID although it certainly looks like what you suggest. 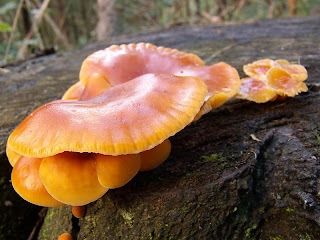 Well worth the trip back to get these fungi as they matured, and to get enough info to name them. I am not familiar with that Sp., so cannot help on that. It is often not easy to find "the spot" where you found something like that. So you did well to find them again, not to mention walking halfway up Mt Wellington a second time, to do it. Such dedication. To tell the truth, these ones are only a few minutes off the road along an almost level track. Not very dedicated after all.